Framed, old-fashioned swimsuits grace the living room of Julia Buckingham and John Edelmann’s Phoenix home. 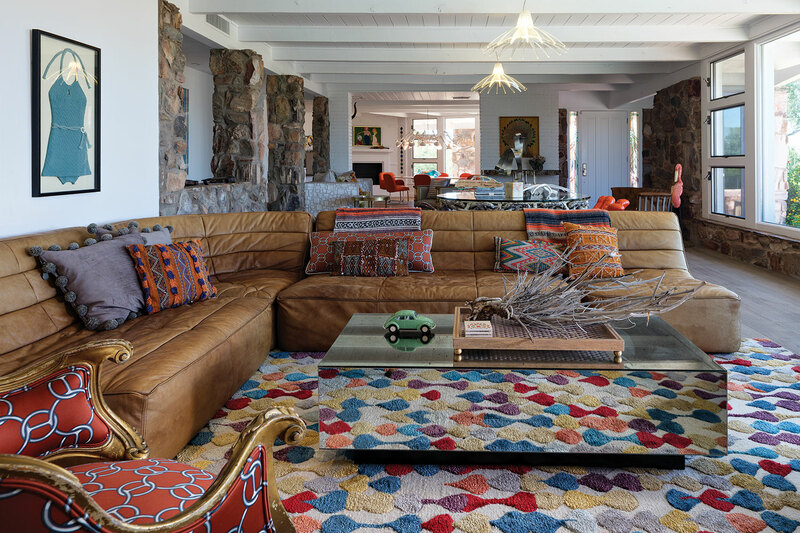 The 1970s leather sectional “makes you magically fall asleep when you sit on it,” says Julia. The antique bergére, with Hermés fabric, adds a touch of glamour to the setting. 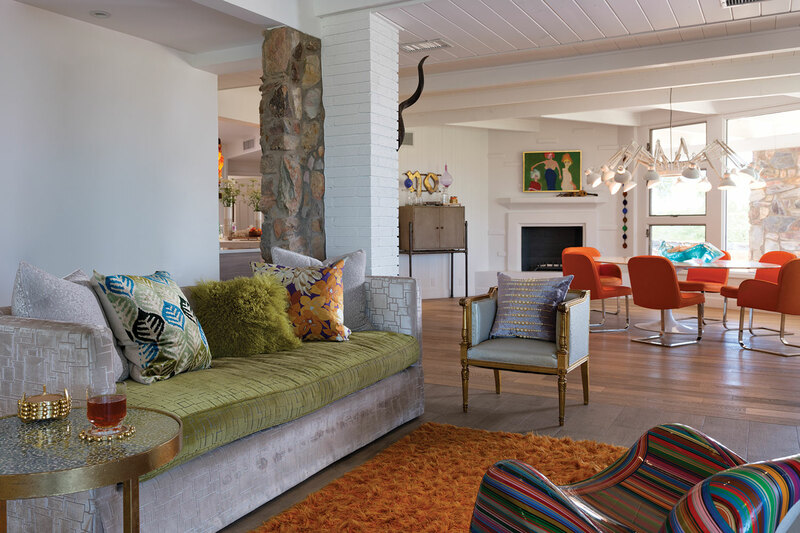 An interior designer’s colorful Central Phoenix dwelling is anything but ordinary. The couple, who have three children, were about to close on another house when they stumbled upon this benignly neglected, three-level hillside gem, built in 1956. A melding of midcentury ranch, desert cabin and Frank Lloyd Wright’s desert masonry styles, the 3,800-square-foot house was designed by architect Mel Ensign for his neighbor, Frank Wallace, a contractor who excavated the petrified wood and stone that figures prominently in the home’s details, inside and out. 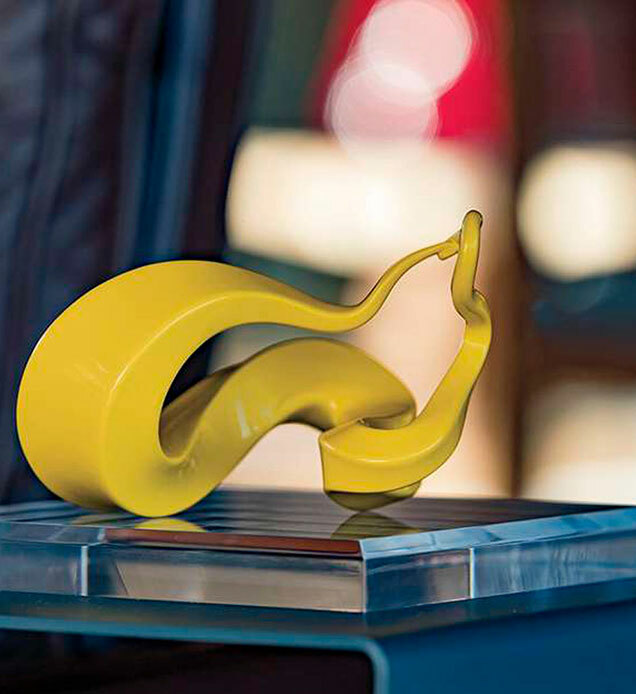 Julia works on design projects with her daughter, Madeline Edelmann. Even though you’re in the city, it feels isolated up here—and the views are great. 1. 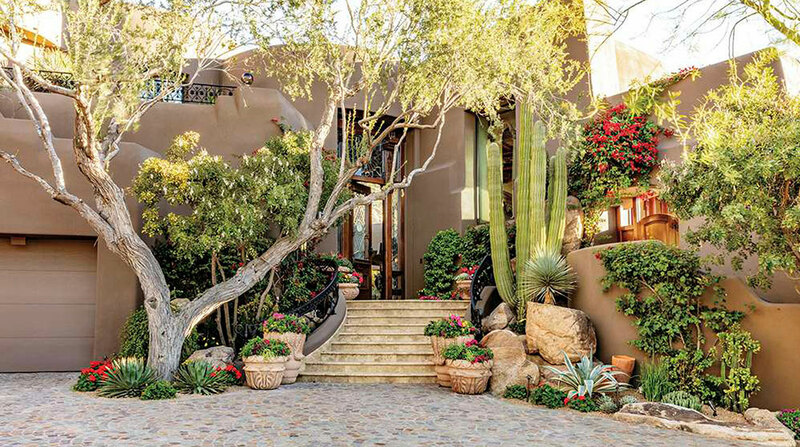 The home’s original stone walls underscore a bank of windows with views of the pool and Phoenix beyond. Julia had the walls and ceilings whitewashed to add more light to the setting. 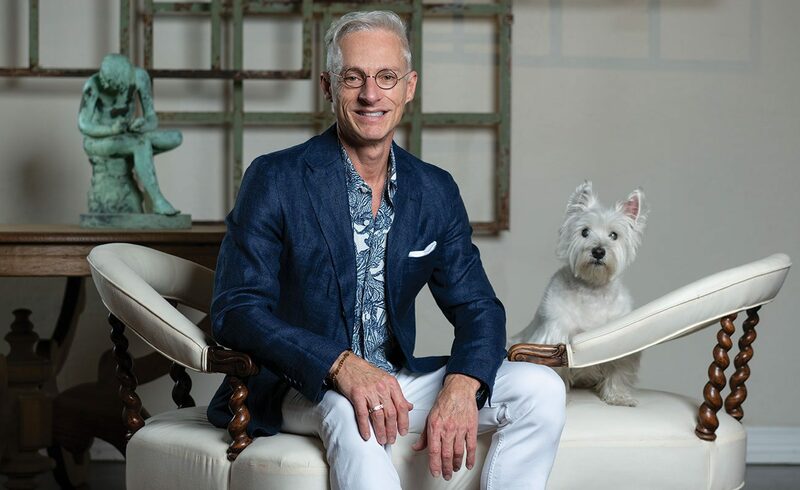 The carved Mexican sling-back chair is a vintage find, and “Dali Llama” is a piece from Julia’s recently opened Phoenix furnishings store, Modernique. “She stared at me so long, I had to take her home. 2. A glass coffee table in the living room reflects patterns from a rug designed by Julia. The room’s stone columns once supported dark cabinetry, which was removed during the renovation. 3. 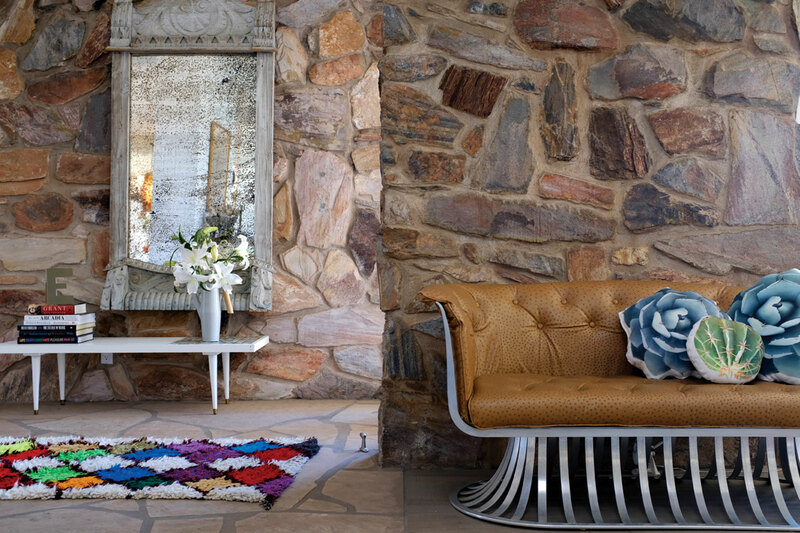 A midcentury modern sofa provides a resting spot next to a rustic stone wall. The antique Spanish mirror—paired with an inlaid tile bench—greets guests at the front door. 4. A velvet sofa shares space with Brazilian artist Mauro Oliveira’s “Hard Candy” striped chair in a sitting area between the living and dining rooms. Buckingham added new wood and porcelain tile flooring throughout to update the home and add warmth underfoot. “We loved the house immediately,” recalls Julia. “Even though you’re in the city, it feels isolated up here—and the views are great.” The interior? They didn’t love that as much. Dark brown cabinetry and finishes lent a gloomy quality, and those great views initially seemed secondary, despite ample windows. Without changing the home’s footprint, Julia worked with Gilbert-based builder Ron Barney to open up the kitchen, redo the bathrooms and replace flooring. 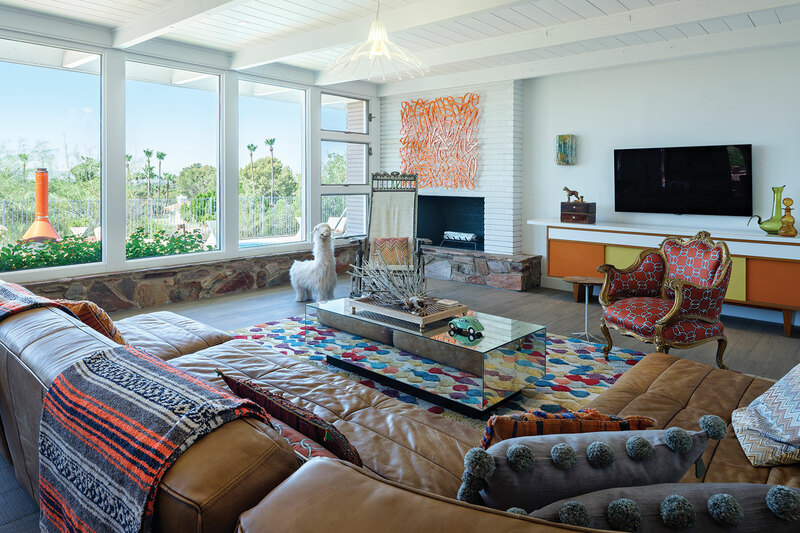 They also whitewashed the walls and tongue-in-groove beamed ceiling to reflect more light into the house, creating a simple backdrop for a collection of furniture, art and accessories. In addition, the builder and designer transformed the home’s original lower-level garage into a casual game room that opens up to the pool patio via glass garage doors. Julia also brought home a vintage console from a flea market, only to discover the top drawer was still filled with the original owner’s dinner place cards. “Dorothy, apparently, got invited to dinner often. Her name is on a lot of those cards,” she says with a laugh. 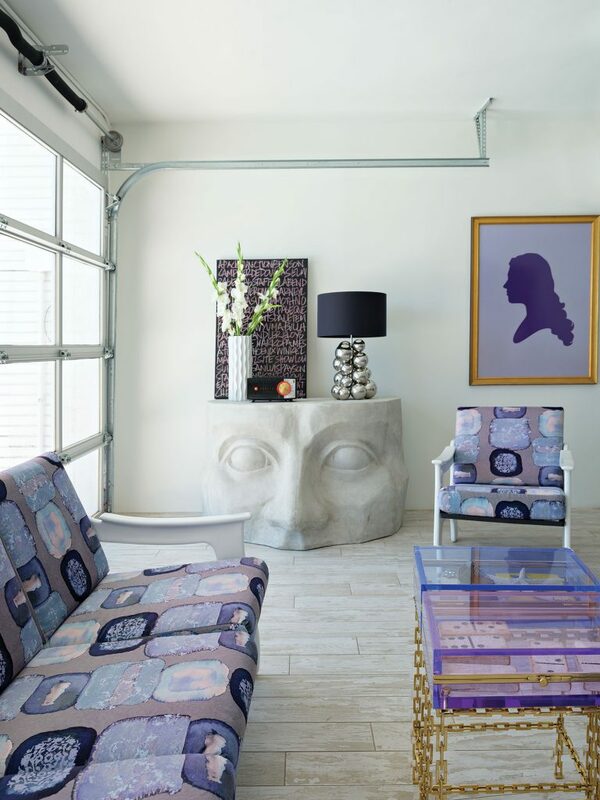 For the game room, the designer relacquered a French outdoor seating set and had the cushions reupholstered in a mod purple pattern. The grouping provides a place to watch guests play pingpong on a concrete table that doubles as a bar and buffet when the net is removed. 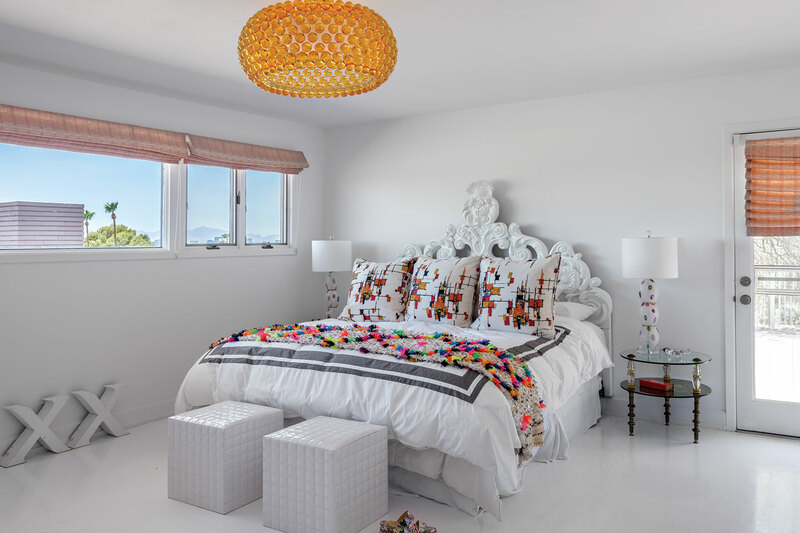 In the upstairs master bedroom, Julia updated an ornate French headboard with white paint and then added an element of vivid color by draping a Moroccan wedding blanket across the foot of the bed. The textile, a treasure found during a trip to Marrakech, is bedazzled with intricate patterns comprising sequins and yarn. 1. A table made from a ship’s chain anchors the living room and is contrasted by an orange “hand” stool, a Chicago find. 2. 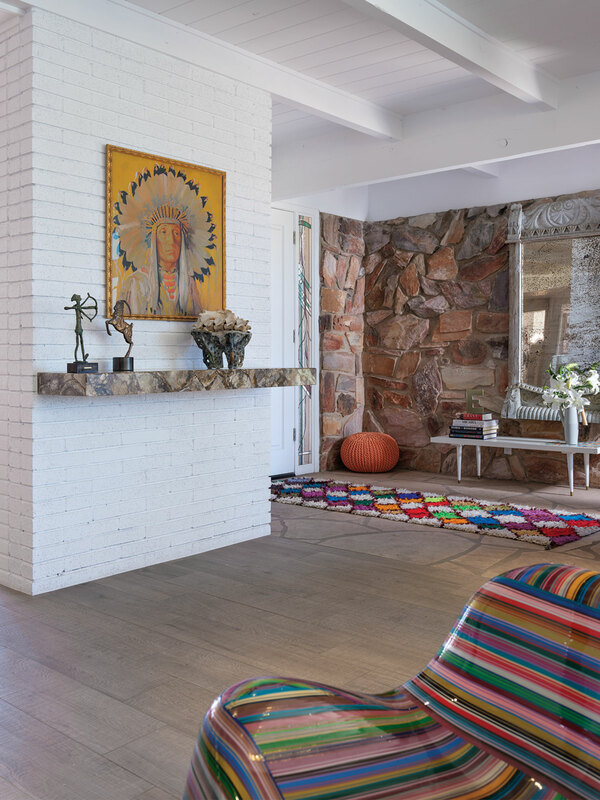 Near the entry, a petrified wood shelf is graced with a painting by Walter Jardine and metal sculptures that reference the homeowners’ astrological signs. 3. 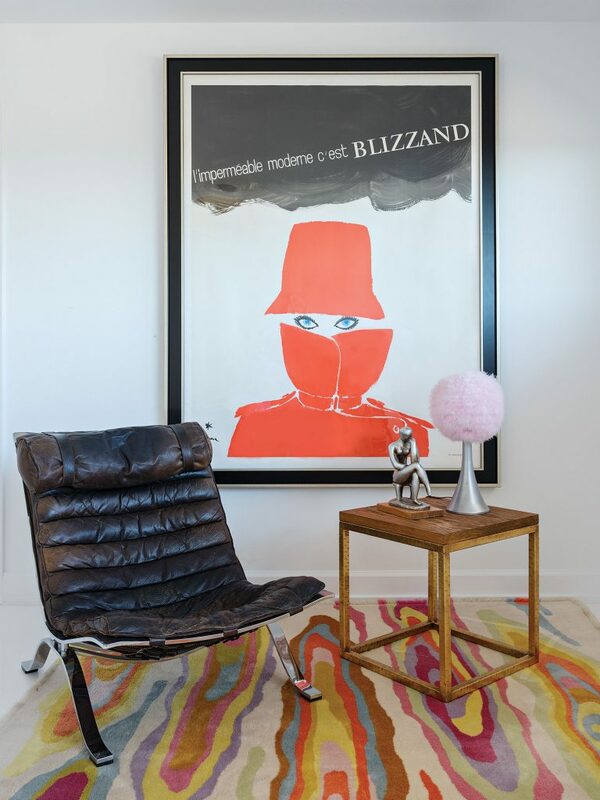 A classic advertising poster by fashion illustrator René Gruau of Audrey Hepburn for Blizzand raincoats brightens a sitting area in the master bedroom. The rug and the chair are vintage finds. 4. The old garage was converted into an informal game room and connected to the pool patio with glass garage doors. The silhouette is of one of Julia and Edelmann’s daughters. The resin “face” table keeps watch over French vintage outdoor furniture and clear display tables designed by Julia. 5. The room’s workspace is an old campaign desk that Julia lacquered orange, her favorite color. The vintage oil painting is a Czech interpretation of an American cowboy. 6. A Missoni side table and a custom op art headboard combine to create a mod look for the downstairs guest room. The couple’s house is never static. 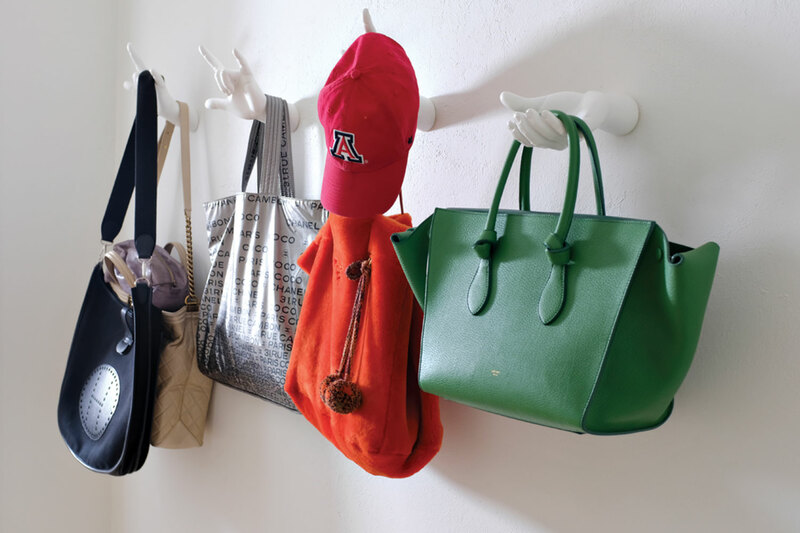 Not unlike changing her wardrobe seasonally, the designer enjoys moving things around (except, perhaps, the weighty anchor chain table), swapping pieces out and redoing accessory and collectible displays on tables and in cabinets. “It keeps things fresh,” she says. That’s one detail that will always be in fashion. Check out this exclusive video for a closer look at the most unusual and cherished chairs in Julia’s home. 1. 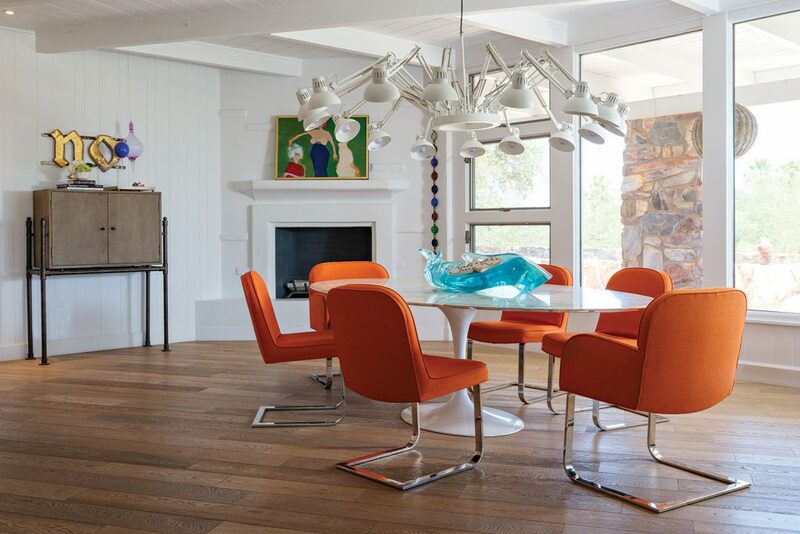 In the dining room, Milo Baughman chairs upholstered in a cheery orange and an Eero Saarinen Tulip Table are illuminated by a task-light chandelier. Artwork and accessories in bold hues pop against the bright white walls. 2. An impala mount guards over the open kitchen, where the freestanding island was fashioned from the family’s old picnic table. 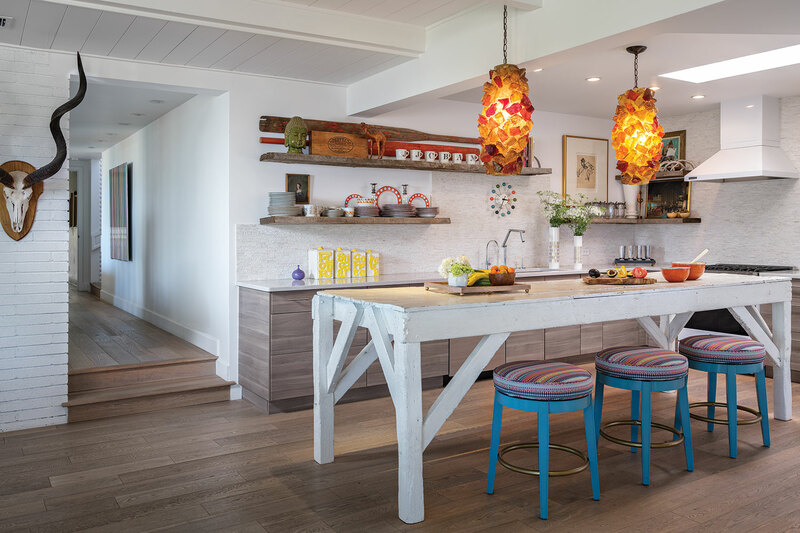 The island is illuminated by a pair of vintage resin pendant lamps that Julia surmises once hung in a smoky bar. 3. Julia lacquered the master bedroom’s wood floors and the headboard white to brighten the space. An exuberant Moroccan wedding blanket adds a splash of color to the end of the bed. 4. Julia’s collection of contemporary handbags, displayed on whimsical hand-shaped hooks, is at the ready in a hallway. 5. Taking a break from work, Julia and her daughter enjoy a game at the concrete pingpong table. 6. The guest room does triple duty as an exercise studio, home office and resting spot for one of the family’s wheaten terriers.